My God is an awesome God. He and He alone is worthy of praise, honor and glory. Jesus and His handy work is to be marvelled at! This evening I went to the world greatest revival were the power of God is falling and Jesus continues to touch and change me. Steve didn't get a chance to preach tonight. He was about to but he was stopped by the Holy Spirit. Instead he gave an altar call. People began to weep, wail and call out to God and the Spirit of the Lord sweep into the meeting. 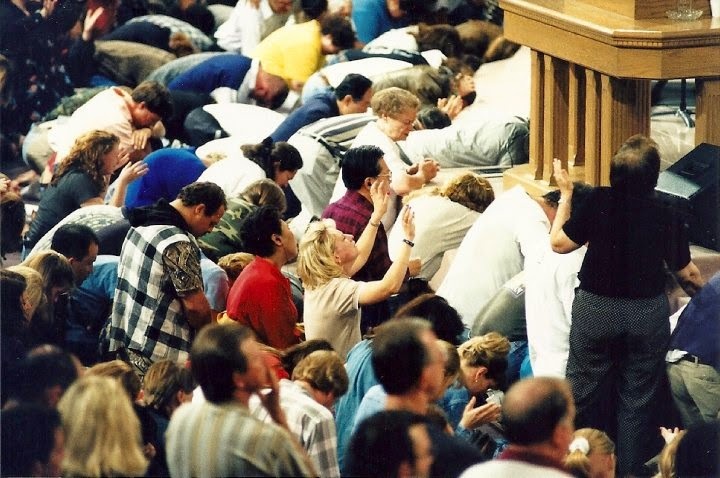 The altars were flooded with those repenting of sin. As soon as my dad and I stepped down to pray for people I felt the sweet, gentle, spirit of the Lord there. It was a different and wonderful feeling. God moved on many people but the Lord was about to really surprise me. We saw a teenage boyfriend and girlfriend standing together and I thought to myself; "They need prayer." The boy was standing behind the girl with his arms around her. We walked up and I asked her if she wanted prayer. "No!" She said nervously. "This is my first time here and I am paranoid." I could tell that she just wanted us to go away. She was seeing everything that was happening around her and she was scared. We took a moment and spoke to them both. I asked again; "Would it be fine if we prayed for you guys?" She said; "You can pray for me as long as I don't fall down." "I can't control God." I said half laughing. "If you could have God really touch you and make himself known to you would't you want Him to, no matter what?" "I don't know." she said. "Look, your boyfriend can keep his arms around you so you won't fall" said my dad. "Ok, I guess you can pray for me." she said reluctantly. I reached out and had just started to pray when she went completely limp in her boyfriends arms. He looked at us as if to say; "What do I do now?" We told him to just lay her down. We then prayed for him and he too ended up on the floor. Later when we came back by the girl was up and sitting next to her mom weeping and talking with her. The Lord had began a deep work in her life. This event so utterly amazed me that I have been thinking of it all night. Jesus is SO awesome. He reaches out to people no matter how they feel at the time. He wants to know us and us to know Him!